The jury of ANCHOR 2018 - Reeperbahn Festival International Music Award will be as top-class as in previous years! On Wednesday, 20 June 2018, in the course of the Reeperbahn Festival New York Edition at A2IM Indie Week presented by SoundExchange this year’s ANCHOR Jury Members were announced: long-standing ANCHOR judge and top producer Tony Visconti is joined by Linda Perry (producer, songwriter, 4 Non Blondes) and Skye Edwards (Morcheeba) and Jason Bentley (music director of KCRW). The award honors the most promising aspiring artists and supports them in building an international career. The ANCHOR will be awarded for the third time during Reeperbahn Festival. Later that night at the Reeperbahn Festival showcase in cooperation with Consequence of Sound, a small but fine selection of musical newcomers entered the stage featuring performances by Akua Naru (DE), HAERTS (DE), Surma (PT), Little Junior (CA), Jeannel (DE) and of course Jade Bird (GB) last year’s ANCHOR Winner. This is the third time that Reeperbahn Festival is being presented in New York as the ideal European platform for new music and the music business, showing a miniature edition of the festival. Last week the Reeperbahn Festival team and a delegation of 18 representatives of the German and European music enterprises travelled across the “big pond” to New York to promote the Reeperbahn Festival in the North-American market at the A2IM Indie Week and to attend the SyncSummit. Go to the recap video of Reeperbahn Festival New York Edition to get the full impression of this promising event. Our partner festival MaMA takes place in Paris between 17-19 October 2018. With three days of concerts and international meetings with more than 5.600 attending professionals, MaMA is the largest French gathering of the music industry. By day, MaMA suggests a program of panels, debates and workshops. By night, MaMA transforms the Pigalle District into a giant urban festival and welcomes 120 international and French artists, bringing together professionals and the Parisian public. Register now for the gateway to the French market! Conference Ticket: Summer Rate Expires In 3 Days! 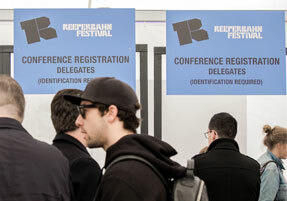 The next Reeperbahn Festival takes place 19 – 22 September. If you’re planning to attend Reeperbahn Festival 2018 but haven’t purchased your ticket yet we highly recommend you take advantage of our benefitial Summer Rate of only €219,- (+ VAT and sales fee) before the offer expires on 30 June! Purchase your discounted Conference Ticket here and save ore than 10%! By 1 July the Regular Rate of €245,- (+ VAT and sales fee) will go into effect.